Flour-The difference between all-purpose and self-rising flour. All-purpose flour is a blend of selected hard and soft wheats. As the name says, it can be used for all types of baking. In fact, this is the flour I use 99 percent of the time. Now, with self-rising flour the baking powder and salt has already been added. It should be used in recipes that specifically ask for self-rising flour such as your grandmother's recipe for buttermilk biscuits. Be sure to check your recipe to see which flour is asked for before you begin. Often no particular flour is mentioned (it just says flour). This means you should use plain ole all-purpose flour. To see how to measure flour accurately go here. Next post I will go over additional types of flour such as bread flour, cake flour, and wheat flour. I'll also cover flour recipes (recipes that use flour as a main ingredient). For more helpful info on different types of flour, their uses, and recipes visit Gold Medal Flour and King Arthur Flour websites. Dash- A dash is a little less than 1/8 of a teaspoon. Mix- To stir in a circular motion usually with a spoon. Move your spoon in a circular motion until all ingredients appear well blended. Just To Boiling- When heating liquid ingredients on the stove this is the point when you begin to see bubbles quickly rising to the top of the liquid. There will be bubbles covering the surface. 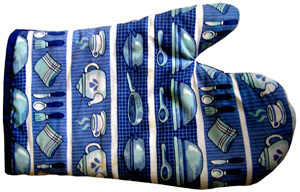 Pot Holder- These usually are sold in a set of two. These are worn on the hands and are essential to protecting hands from burns. Ladle- A long-handled spoon with a large bowl on the end. Useful for ladling soups, stews, hot cocoa, and other liquid-based foods into serving bowls or other containers. Saucepan- A heat-resistant metal-based container used on the cooktop to heat ingredients. The long handle helps keep your hand (inside a potholder of course) a safe distance from the flame. 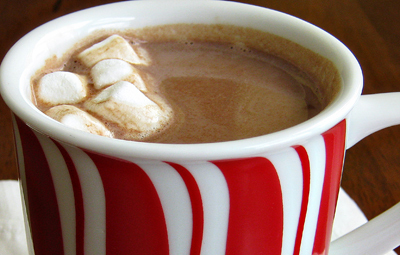 One last Ingredient for the Hot Cocoa; sugar. Here's a link to a previous post on different types of sugar.